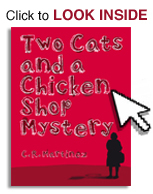 Three weeks after its release the word about Two Cats and a Chicken Shop Mystery seems to have spread to quite a few corners around the world (check out the chart!) and I know this is mainly due to YOUR great support! 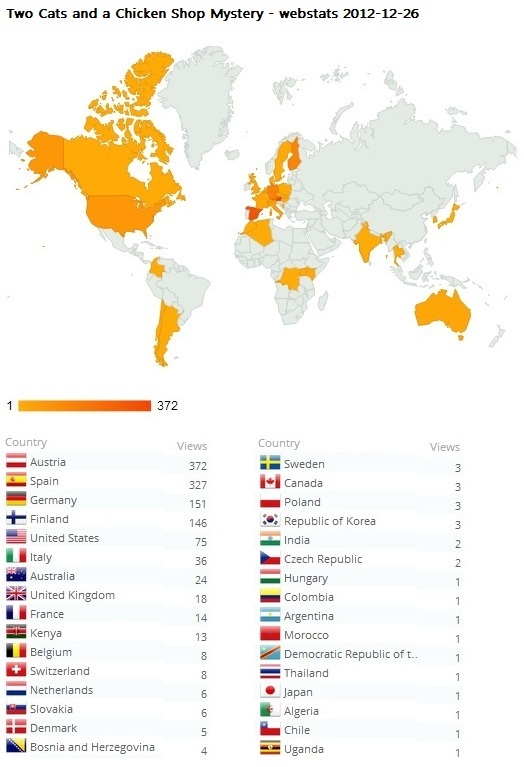 Thank you so much for spreading the word across the world! And, of course, please keep downloading for FREE until 13 January 2013! Last Minute Christmas Gift? For FREE? Thank you! Please, tell your friends. One week after its release Two Cats and a Chicken Shop Mystery is opening its secret gates to the Image Gallery and Bizarre Facts. Those who’ve read it can now enter these sections of the website with a password hidden in the book! Enjoy and thank you for the download! Please, tell your friends. Please, check out Cristina’s website. The absolutely best graphic designer one could ever wish for!